This is the fourth and latest version of Ron's website. This is a customized Wordpress site that allows Ron to update the content quickly and easily. This site also gives him the opportunity to showcase larger images of his work with a rotating gallery on the home page, bigger thumbnails on each painting landing page and much larger individual detailed paintings to really show the brushwork and spontaneity of the his paintings. This new template is completely responsive so that the larger images will automatically wrap and stack on smaller browsers. The site also contains a video that shows his typical "day at the office". Create a new site that showcases the artwork and does not bring attention to itself. We also helped him launch a successful Tumbr site that has thousands of followers. 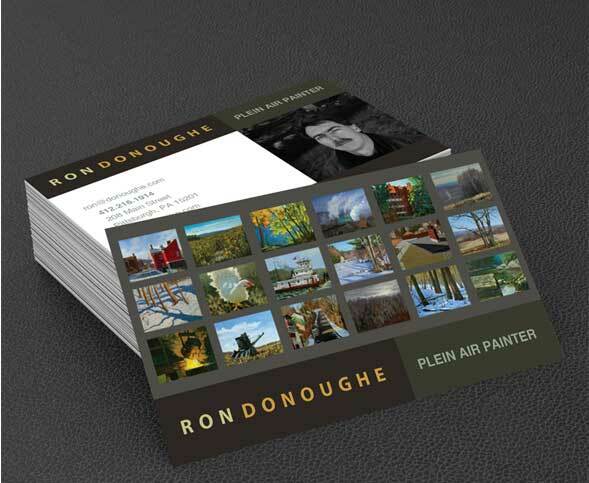 Ron Donoughe Landscape Painter Don created a visual brand that has helped me achieve remarkable success. The web site showcases my fine art in an elegant way while the business card and other printed materials carry the same thread of design. He has also helped me understand and use Facebook and Tumblr as additional marketing tools.